This is, in part, an email that I sent to Julia’s Computer Art teacher. She wrote yesterday asking for some guidance on how to work with Julia who has been unskillfully flirting with a few boys in her class, reacting to the boys’ awkward reactions with anger and swearing, and also swearing generally when she is unsatisfied with her work. The work is learning Adobe Illustrator and learning it according to a teacher’s instructions. My immediate answer to her query about Julia’s behavior was that I was seeing these behaviors more frequently. Her teacher responded that it was great to hear that Julia is liking the class because that is not the read she always gets from her. And from that, I felt the need to explain . . . . This may be more than you want to know: There doesn’t seem to be much that is truly intuitive about Illustrator. Julia has less complicated art programs on her ipad and she has played with them by herself and without direction until she figures them out. That is the way she prefers to learn anything really, by herself and with lots of room to erase or disassemble and redo. It took her a number of Lego sets to learn that the directions say to open only one packet of pieces at a time for a very good reason. She has become a master at following those Lego instructional books but not before a number of them were flung across the living room. When she began making bracelets on the Rainbow Loom, she wanted to do it very quickly. Those directions are tedious beyond my patience and in order to get the results she wanted, Julia had to follow the instructions slavishly. And now she does. Of course, Julia comes to this skill set so much later than her peers. The lessons of Lego and Rainbow Loom are age appropriate for the under ten set, they are lessons Julia digested at 14, 15 and 16. Many of the learning skills she needs to learn something like Adobe Illustrator from a teacher are recent acquisitions, new and not globalized skills, or simply skills on the raw edge of her learning. Learning Illustrator with an entire class and with a teacher directing is anathema to her. She hates following directions that are not at her pace. She learns steps at a glacial speed and then jumps miles ahead when it all clicks. She hates learning about something she is not immediately interested in or following a step by step process when her interest is suddenly yanked somewhere else. Julia is not and never has been a student. This has always been the challenge but with rigorous art classes, becoming a student may finally be at her raw edge of learning. If she can learn to follow the path you are offering in the way you are offering it, learning may open up for her. This is what I hope that art classes can do for her, open the possibility of learning. Show her that following directions that she may not like, following a teacher whose instructions may be too hard and too easy, can get her somewhere she wants go. Learning art from a teacher could teach Julia to be a student. This is not to say that Julia has never learned or dedicated teachers have not taught her anything. 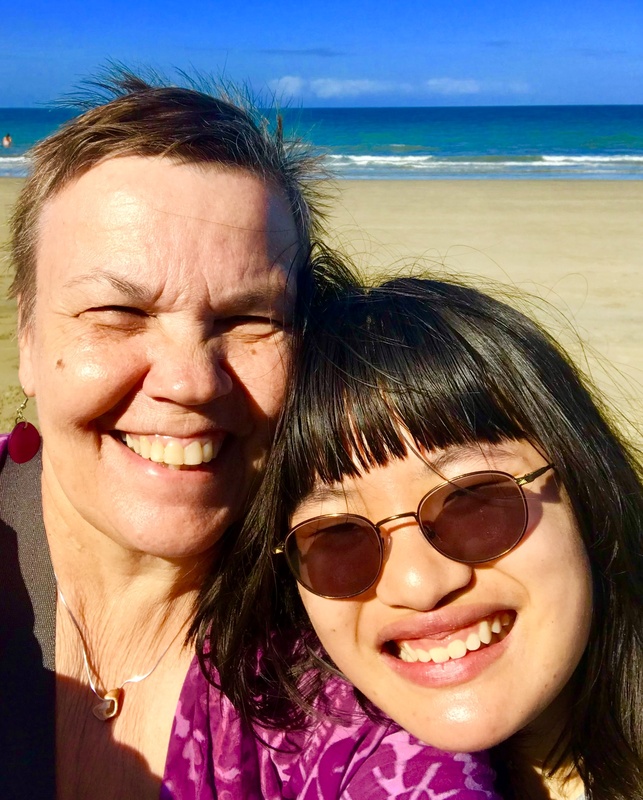 Julia’s atypical brain has had a wild learning curve and she has been more than blessed with loving and dedicated teachers and therapists. But her most successful teachers have had to teach Julia on her terms and school doesn’t work that way. Neither is that the way to acquire skills in the most efficient way. If she wants to get somewhere, do an intentional something, she needs to hitch her wagon to learning what a teacher is teaching. In Adobe Illustrator she needs to learn about a million tiny, tedious steps before she dives into purple dinosaurs and anime. Learning Adobe Illustrator from a teacher could chip away at Julia’s reluctance to enter into future thinking. Julia lives in the now. Memory is hard work for her and she would rather the future did not exist. For the last week, I’ve been working on the Illustrator online tutorials at home, and when Julia gets home from school, I show her what I learned and she shows me what she learned in class. We can both be hopeless at showing our day’s learning (I seem to remember nothing from those easy and purposeful tutorials.) but we plug away and find something on youtube to watch. In small increments, we are working on memory and on looking towards the future. I want Julia to have a future. This is way longer than intended and I’ve waxed philosophic answering a simple observation but I want you to know how important you are and how important the work of teaching and learning is for Julia and her development. Once again, you articulated your thoughts so clearly and concisely. Lovely! PS I just had a conversation with Aidan (now a teenager) about cursing. It’s like this age group is trying on new ways to behave, and testing the boundaries. Oy! Swearing. When Cheshire went through that phase, I’d tell her swear words were cheap words and she should use expensive words. LOL! I must have explained it better than that, but for the most part it worked. You handle issues so well. I am learning a lot, just how to handle difficult situations.